A4 format with a hard cover, 120 pages, 147 black and white photo of various quality and 4 pages of poor quality but still interesting plans. Interesting shots of all five ships of the class plus two very good photos of HMS Glowworm at her loss. No artwork and incomplete history. Dissapointing due to the lack of artwork yet interesting because of some of the photographic content. Although this book is marked as number 2 in the War Camera Photobooks series, it's actually the third because the first one, on B-25 Mitchells, was in two parts 1 and 1B. One of the major attractions of the Kagero books is their colourful artwork on what-ever the subject is. Well, unfortunately, there is none in this one, just some poor quality but still interesting plans of the last two of the class, Seydlitz and Lutzow, which look like they have been laying about in the sunlight since they were printed 65 to 70 years ago. The first was Admiral Hipper. There is extensive coveradge of this very famous ship from its launching to laying derilict in Heikendorf Bay and used as a dump for other ship bits, namely Type XXI U-boat sections. Along the way, there are two very interesting photos of HMS Glowworm crossing Hipper's bows while laying a smoke screan. The first, I've seen before but the second, new to me, is much clearer and shows the Glowworm in a Dark Hull/ Light Superstructure colour scheme at the time of its loss. Now this is apposed to what some experts claim, that she was in over-all light grey from pre-war. The next is Blucher - the only one of the five to be sunk in combat. It was torpedoed by Norwegian shore mounted tubes in a Fjord with a very heavy loss of life, particularly among the troops she was carrying for the invasion of Norway. 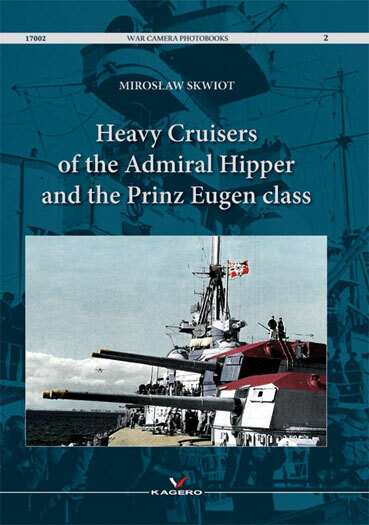 Oddly, this is not mentioned in the text, just on the back cover where they say “Four out of the five cruisers presented in theis book survived the war, only the Blucher was lost in action”. Now, considering that Hipper was found derilict at wars end, Blucher was sunk, Seydlitz was never completed and Lutzow was sold to the Russians and also never completed with only the Prinz Eugen being in fighting order and handed over to first the British and then the Americans and expended in the Bikini Atoll bomb tests. The statement on the back cover is like saying the light cruiser Emden survived the first war. Because its life was short so the photo history of Blucher is short. Then we have the Prinz Eugen, the most famous of the five and the only one to really survive the war. She was the largest ship to be handed over by the Germans and interestingly sailed under three different flags, German, English and American. Along with Hipper, Eugens coveradge is extensive again from launch to sailing under the Stars and Stripes. Again oddly, there are no shots of it in or after the Bomb Tests, yet I'm told that up to recently, it was still visable. Of interest along the way are two photos of her missing stern, blown off by a torpedo from British sumarine HMS/m Trident, showing the temporary stern and the steering arrangments, a big group of jolly jacks turning a capstern connected to the twin rudders mounted on the jury stern. The last two, Seydlitz and Lutzow, were not completed so their sections are also short but interesting none the less. Seydlitz was to be converted to an aircraft carrier although work was again cancelled, however there are two pages of plans among those mentioned earlier. This title is a bit disappointing because of what is not there, but also interesting thanks to what is. The artwork could be covered by one of the other series put out be Kagero, 3D for instance, and probably much better done too.